Powered by an IntelÂ® CeleronÂ® J3455 quad-core 1.5GHz processor (burst up to 2.3 GHz), 2GB/4GB DDR3L RAM (up to 8GB), dual Gigabit LAN ports, and supporting SATA 6Gb/s hard drives, the TS-453Be provides dependable performance of up to 225 MB/s read/write speeds. The TS-453Be features IntelÂ® AES-NI hardware-accelerated encryption to drive transfer speeds of up to 225 MB/s with AES 256-bit encryption for both full NAS volumes and shared folders, boosting system performance while ensuring the security of sensitive data stored in the TS-453Be. Featuring advanced 9th-generation IntelÂ® HD Graphics, the TS-453Be supports dual-channel 4K H.264/H.265 hardware decoding and real-time transcoding, allowing you to convert videos to universal file formats that can be smoothly played on multiple devices*. Therefore, you can easily share movies and videos stored on your NAS with family and friends for their enjoyment on a range of devices. 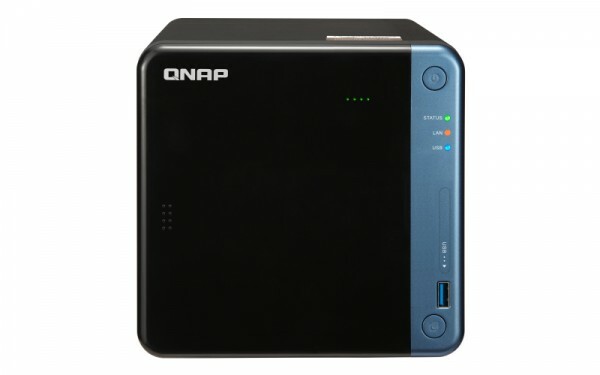 The QNAP RM-IR004 remote control (sold separately) can be configured using QButton to customize the actions of individual buttons, providing a more convenient NAS experience. Virtualization Station allows you to run multiple WindowsÂ®, LinuxÂ®, UNIXÂ® and Androidâ„¢ virtual machines on the TS-453Be. You can use Virtual Network Computing (VNC) through a browser to manage the VMs. Virtualization Station is ideal for organizations to run multiple applications on a single NAS. Container Station integrates LXC and DockerÂ® lightweight virtualization technologies. You can download apps from the built-in Docker HubÂ® to easily import/export container apps and manage access control, enjoying the benefit of easy installation, transferability and high-efficiency. QNAPâ€™s new QVR Pro surveillance solution allows you to arrange a dedicated, independent storage space for surveillance data on TS-453Be and leverage the advantages of scalability and storage manageability from QTS. With QVR Pro, camera management, storage space allocation, camera live view and playback become more easily. You can also use QVR Pro Clientâ€™s mobile app to monitor anytime, or use a USB webcam as an ONVIF network camera with the QUSBCam2 app.